Last night was freezing cold. Probably the coldest night thus far this “winter” (I use “ “s since we haven’t had any snow, unless you count the freak Halloween storm). P picked me up from work, we went grocery shopping, and then came home. My December and January editions of National Geographic were waiting in the mailbox and it was one of those nights when you want to bury under a pile of thick blankets and read… which is exactly what I did as soon as we came through the door with the groceries. Instead of taking our dog right out and getting the chilly part of the evening over with, I thought I would warm up a bit with a cup of tea, curl up in a comforter and quickly skim through the magazines before taking him out. About an hour later, P and I were ready to start making dinner—pasta with veggies and alfredo sauce, so I put on my favorite sweat shirt and wrapped a warm scarf around my face and put on my winter coat and gloves, grabbed Sampson’s leash, and our apartment keys, and headed out the door. Sampson happily scampered out with me and waited for me at the top of each set of stairs. When I opened the downstairs door he burst into the crispy night air. It was dark, and no one was out, so I didn’t bother to put on his leash. We crossed the road to the sidewalk alongside the park and I gave him a few minutes to sniff around and pee, but it was cold and I was eager to get back inside. After a few moments I coaxed him back across the road. As usual he walked around the apartment parking lot, sniffing here and there. I walked up to the apartment door and called out for him to come, and heard his dog collar tag tingle tingle off to the side. I spotted him sniffing under a car along the wooden fence that separates our parking lot from the train tracks that run behind our building. Then I heard Sampson let out a little growl/bark, and I yelled over to him more urgently to come. It took a few tries before he started trotting over, and I briefly glimpsed a bit of white sneaking away through a hole in the fence. I figured Sampson was teasing a cat. Until I got a whiff of skunk. When Sampson reached me on the apartment stairs I bent down to smell his body and took in a deep breath of what I can only describe as a pungent burning tire kind of smell. It didn’t smell like the skunky smell you detect in the air when one gets hit by a car, or sprays something in the neighborhood, it was much more intense. Like it was literally burning olfactory cells in my nose. But I wasn’t 100% sure, because it wasn’t distinctly skunky, just really horribly bad. 1. Before handling your dog, you may want to put on some old clothes. Skunk spray is actually an oil and is very difficult to remove from clothing. 4. You can use paper towels to soak up the oils from the coat before you begin washing. Be careful not to spread the oils from one part of the dog to another. Only wipe where the oils are already to avoid making the problem worse. Well- I already failed with tip #2 as it was freezing outside and we live on the top floor of an apartment building so I couldn’t leave him outside. As for tip #3, I tried to locate where on his coat he was sprayed, but I couldn’t find a wet oily spot anywhere. I tried to wipe him with a paper towel but since I couldn’t find the oil spot it didn’t work. I tried to call my Dad, who over Christmas break was telling us about how our old Black Lab Jack used to get in a lot of “wilderness” trouble before us kids were born, and how my dad and mom had to use pliers to pull porcupine quills from his face once. I figured he would have some advice, but he didn’t pick up the phone. Next I dialed my mother, but she also didn’t pick up. So we were on our own. I had only ever heard of tomato juice helping with skunk smell, so I went to our cupboard to see what we had. There was a jar of tomato garlic marinara sauce, and I figured garlic is better than skunk. “But Mer, the website says the sauce might dye Sampson red!” P said. “Do you really care what color he is right now?” I asked. I stripped down to a t-shirt and underwear, opened the glass panel of the shower and poured the marinara sauce all over the dog, little bits of tomato and garlic matting into his fur. Of course Sampson shook out his coat, as dogs do, sending tomato sauce splattering all over me and the walls of the shower. I imagined it looked a little like the shower after the murder in Psycho. I yelled at him, while reaching down to rub the sauce deeper into his fur, and he, in turn, happily started licking up the sauce that was floating around the bathtub. And if I couldn’t get P to eat marinara sauce before, I certainly won’t be able to do so after this! I concluded round one by spraying Sampson down with our shower hose until he looked like a drowned rat. Next I called to P to give me the mouthwash. Again I figured it couldn’t hurt, and splashed blue minty alcohol over his head and back. Another rinse. Round three was shampoo. P emptied a bottle on his back from the safety of the opposite side of the glass shower door, while I used my nails to scrub the shampoo deep into his coats. I rubbed and rubbed and rubbed, then rinsed and rinsed and rinsed. We grabbed an old towel from the closet and soaked up the access water from his fur, and P took him out to the hallway to run back and forth a bit to dry off further. Finally P took a large canister of talcum powder that his dad always sends from Nepal and we coated him in it. I wasn’t sure if it would help but P insisted that at least it smelled nice. Our black pup temporarily became white (“he looks like a skunk now” P mused), and again ran up and down the hallway, leaving puffs of powder in his wake. It took me a while to unclog the bathtub, which was now filled with murky water, wads of black fur, and bits of tomato and garlic. Later when I took a shower I was finding specks of spaghetti sauce in nooks and crannies all over the bathroom. By 9:30 P and I finally made our pasta dinner. So much for a quiet, cozy evening. The rest of the evening Sampson kept giving us his pathetic puppy eyes that said, “What did I do?”… and my co-workers assured me in the morning that I don’t smell, but to me everything still has an essence of burning rubber. Kukur Puja is one of my favorite Nepali festivals. It is part of the Tihar cluster of events including Kag Puja (crow puja, yesterday), Kukur Puja (dog puja, today), Laxmi Puja and Gai Puja (puja for prosperity and for cow, tomorrow), Thursday is a series of pujas I’m not as familiar with (Goru Puja, Gobhardan Puja, Maha Puja and Nepal Sambat as explained by NepaliAustralian), and lastly Bhai Tikka (brother puja, Friday). In our household we usually only celebrate Kukur and Laxmi puja and Bhai Tikka. One reason I love Kukur Puja is because I am a big “dog person.” Luckily P is too, or we would probably have a big problem! My dad had a black lab named Jack when he married my mom and we had him until I was in fourth grade. I always remember him as an older dog, reserved and calm, and he never minded when my sisters and I would bug him, or lay all over him. Even though he was around when I was a kid, he wasn’t really my dog, he was always my dad’s. A week or two after Christmas my dad found an advertisement in the newspaper for cocker spaniel puppies, and he took me to the kennel to check them out. There were little black and white puppies scurrying here and there. One of them tried to eat my shoelaces, and I fell in love. I brought him home and named him Blackie (he was all black with a white stripe down his neck). Blackie was my constant companion until I left home. We used to go trudging through the backwoods together, covered in mud; sledding down the hill in our back yard together, little chunks of snow and ice matting in his curly hair; he even went on jogs with me as a high school cross country runner, although I’m sure mid-summer 6 mile runs were not his favorite. We dressed him up in baby clothes and diapers (my youngest sister was born the same year as Blackie), brought him along on long family trips in the car, and nursed him back to health when he was attacked by a two ferocious dogs that lived down the street. Having a dog when you are really young probably helps someone to grow up with a soft spot for dogs, and to not be afraid of them. Various people I know tell me that they are scared of dogs, sometimes because they were once bitten or attacked by one. I was also attacked by a dog once—my friend who agreed to take me to the big “eighth grade dance” had two big dogs behind an invisible fence, and my school friend and I rode our bikes over to his house not knowing the dogs were out. As we started walking up the drive way the dogs charged at us, and my friend had the sense to step backwards behind the invisible fence but I didn’t, and instead put my arms up to protect my face. One of the dogs latched on to my left elbow and started biting, leaving a nasty bruise/puncture wound. I had to go to the hospital and get a tetanus shot, but luckily no stiches. And in true 8th grade fashion, I had a dress with no sleeves at the dance so I could show off my battle scars to everyone all night. But luckily I had a lot of positive exposure to dogs as a baby and small kid, which preempted me from developing any major fears. I did a petfinder.com search for cocker spaniels (since that is what I had as a kid, and felt confident I could properly take care of one, “I can do #1, and #2, and #3…I promise!”). I was particularly partial to black dogs, since I had two growing up. Sampson came up on the search results at a rescue in New Hampshire (although they said he is “part cocker spaniel, part retriever” people tell us he looks like all sorts of things, but the key word “cocker spaniel” brought him to us). He was cute, and black, with a white stripe on his neck–like Blackie!—and he was a rescued stray from the streets of Puerto Rico—an intercultural dog! Perfect! So P and I put in the application, begged our landlord some more, and two and a half years ago Sampson joined our household. Now he is a spoiled little mutt, because P and I nearly treat him like he’s our real baby. He gets momo snacks from P when momos are on the menu, and egg yokes when I’m making waffles, and he already tried a piece of yak cheese when I returned from Nepal. And every year on Kukur Puja he gets a special tikka, a flower garland made just for him, a new toy, a tasty packet of new treats, and special treatment all day. So if you have a little pup in your life, feel free to give him some extra love today! Sampson is the king of sad eyes, even with his happy, easy life in the AmericaNepali household! The past few days have been busy, and will finish off tonight with a celebration of “Bhai Tikka”… no wonder my masters thesis isn’t finished yet! There is something new every week. However, every time I participate in these festivals I learn something new… I swear, it’s educational! Anyway… as part of Tihar (as you guys all now know… what Nepalis call Diwali, the “festival of lights”) there are several days, where each day is “special” for a specific thing. One day it is crows, another day cows, another dogs, then yourself, and finally brothers. As part of the festivities you are suppose to do a special “puja,” or ceremony/prayer, for each thing on their specific day and (I guess the word is) “spoil” them with treats and attention. This is hard… P and I don’t have a bunch of crows and cows wandering around, but this year we were in luck… because in January P and I adopted a dog–a cute little rescue mutt from Puerto Rico. So this year we had a chance to celebrate “Kukur Puja”—kukur meaning “dog” in Nepali. Thus Sampson had a special Saturday, filled with treats (especially his favorite- cheese! ), puja and lots of love! The holiday essentially celebrates the old adage “dog is man’s best friend” or as Wikipedia so eloquently explained, the holiday “acknowledge[s] the cherished relationship between humans and the oldest ever tamed animal.” It was the first time P and I celebrated, so we invited our friends AS and N over to help. We lit some incense, and made a flower garland for Sampson and gave him a red powder tikka for good measure. 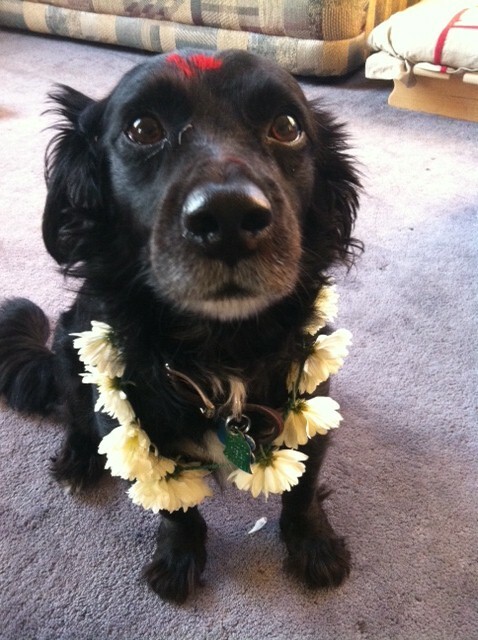 I must say, he looked awfully cute (although the flower garland didn’t last long). Other then that, we spent a large part of the weekend driving back and forth to central New York for a Diwali party at a friend’s house. As part of the party we all dressed up South Asian style (of course, I’ll jump at any excuse to do so!) and lit lots of little tea lights to welcome Lakshmi, the goddess of wealth. Supposedly, on Lakshmi Puja she visits houses that are clean, adorned with lights and where the people are hardworking (not lazy!) and she brings wealth and good fortune for the upcoming year. Tonight is “Bhai Tikka” when “sisters” celebrate their “brothers” and the brothers give their sisters gifts in return. AS is planning a puja and gathering, so I’ll write more about that later. Phew, between American and Nepali holidays… autumn can be exhausting!